I have derived surface temperature from the Landsat 8 thermal band 10. I want to calculate the mean, median and maximum temperature of the 14 different small areas that are within my spatial extend. I have already clipped the temperature raster file to the outline of the small areas vector layer. Now I have tried Raster > Zonal statistics which simply does not return anything and I have tried the Zonal Statistics from the plugins, which returns empty values. This is probably a projection issue. When I saved the polygon as a new shapefile (selecting EPSG 32655), Zonal statistics worked. Not the answer you're looking for? 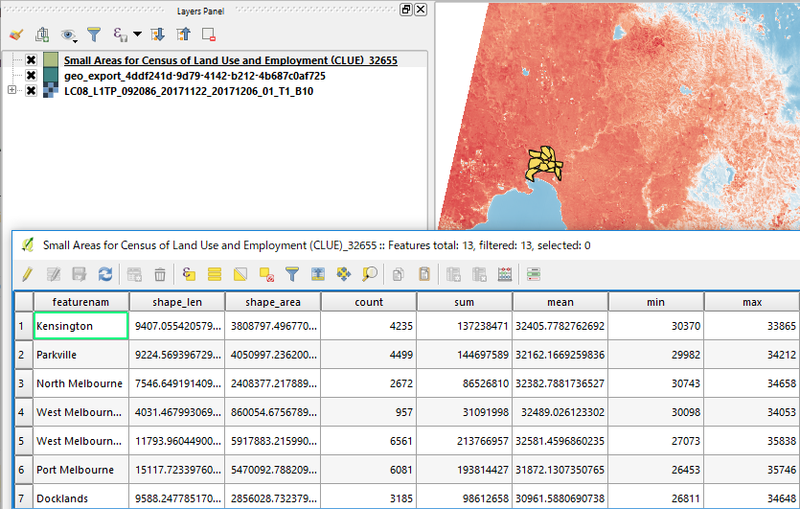 Browse other questions tagged qgis qgis-plugins landsat zonal-statistics or ask your own question. Why does Zonal Statistics as Table return an empty table?